Students, artists and enthusiasts took part in a series of workshops at Craven College during summer 2013, building five giant woodland creatures inspired by Skipton Castle Woods. These willow-and-bamboo processional puppets featured in a Woodland Festival in the Woods and as part of Skipton’s Yorkshire Day celebrations in early August, and came out again for the Puppet Parade as part of the Festival. 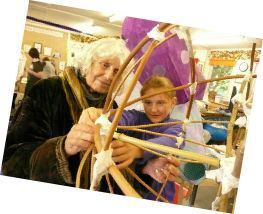 These workshops were delivered by Alison Duddle of Horse and Bamboo Theatre and Kerith Ogden of Handmade Parade, and were undertaken with the support of the Woodland Trust. The Yurt is a frequent visitor to Skipton Puppet Festival; in the run up to Festival '13 it appeared in Skipton Castle Woods as part of the Woodland Festival, where puppeteer Vanessa Card worked with children to make simple clay figures and stick puppets; it reappeared outside the Stepping Stones II Community Nursery in Aireville Park for the August 1st Yorkshire Day Festival for families to participate in withy puppet making activity; it became a key puppet making space at the Festival itself, with over 150 puppets made over the festival weekend. In another drop-in workshop marquee an additional 200 puppets were made at Festival '13. We ran two open weekend workshops at Stepping Stones II immediately prior to Festival '13, where families, artists and puppetry enthusiasts created large (and small!) puppets for the parade, with the support of artists Kerith Ogden and Fran Sierevogel from Handmade Parade These workshops were by donation, to allow everyone to get involved. SELFA (Skipton Extended Learning For All) deliver enrichment activity targeting vulnerable and disadvantaged families in the Skipton area. They ran two week-long summer holiday workshops prior to Festival '13, for their target groups and other young people in the area. The workshops took place at Aireville School, and were led by artists from Handmade Parade. 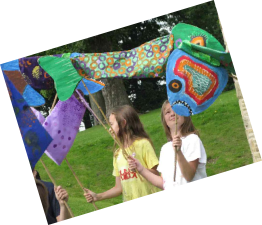 These workshops offered an inclusive community arts experience for participants, who created shoals of vibrant puppet fish and then performed them in the parade at Festival '13. The experience offered skill-building, confidence-building, and a transformative experience for those who took part. The Broughton Road Pakistani community is North Yorkshire’s only identified minority ethnic community. Broughton Road Women’s Group are a group of women who come together on a regular basis for social and educational activities. 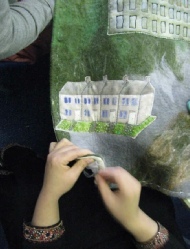 For Festival '13, their second involvement, the group worked in partnership with the local Embroiderers Guild and textile artist Jackie Lunn to create a triptych of story cloths, made using hand dyed calico, needle felted wool, silk painting, appliqué and embroidery. Drawing on memories from the community, the cloths use fabric and stitch to tell the amazing story of how a small group of farmers from Kashmir in Northern Pakistan swapped a life in the fields for the textile mills of Skipton. 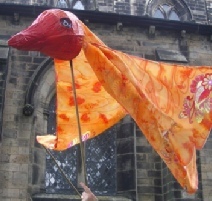 This project was first shown at the 2013 Puppet Festival and has since toured around North Yorkshire, appearing at Settle Storytelling Festival and Yarndale Festival amongst others. For Festival '11, four Giant Swaledale sheep and Sammy the sheepdog were created in a residency by Thingumajig Theatre. The project was supported by Skipton BID (now Skipton Town Partnership). 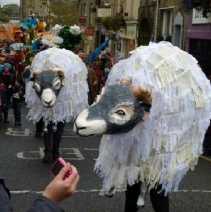 The Giant Swaledales have since performed for numerous local festivals and events. They are performed and curated by the original workshop participants, although the group is now looking for more volunteer performers to play sheep. The Giant Swaledale is a symbol for the Yorkshire Dales National Park and Skipton is 'sheep town' by definition; these local characters have become a symbol of the town, and are firm favourites wherever they perform. The Broughton Road Pakistani community is North Yorkshire’s only identified minority ethnic community. Broughton Road Women’s Group are a group of women who come together on a regular basis for social and educational activities. 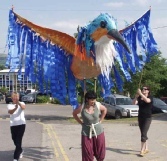 The group participated in Festival '11, making giant silk birds with puppeteer Diana Bayliss and artists from Kala Sangam. The group used Asian silk painting techniques and Mehndi patterns to create three giant birds and five smaller birds, which featured in the Puppet Parade and were later exhibited at Kala Sangam. Why not take part in the forthcoming festival and join the Parade! 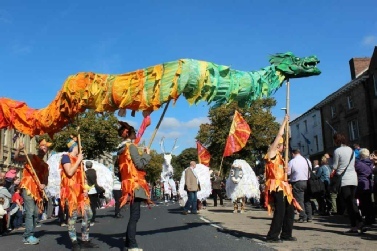 Community groups can apply for a bursary to build a fantastic parade puppet. Find out more here. Application deadline 30th June 2017. We will also be running open weekend parade puppet workshops for individuals and families on 16th/17th and 23rd/24th September at Skipton Girls’ High School. Details coming soon. Become a volunteer at the festival. Find out more here.